It seems that Pandigital is one of those companies that just can’t make up their minds about what design of a product they want to go with. It has been their habit to release about a half dozen different variations of a single device, with some clearly inferior to others, so you really have to pay attention to which one you are getting. This time it looks like Pandigital has yet another variation of the Pandigital Planet up their sleeves, the Pandigital Planet II. There are already two other Pandigital Planets, one comes with the Kindle ereading app (I’m working on the review for it right now) and the other comes with the Nook ereading app. Both were released over the past couple months, so it’s about time Pandigital finally came out with a second generation model. At this rate they should be announcing a Planet III sometime next week. Joking aside, the Planet II just turned up on QVC. It sells for $169 and starts shipping on September 23rd. There are virtually no specs given for the new Planet, but there is one interesting detail. It says it comes with 4GB internal memory. That’s important because the other Planets both come with 2GB of memory, and is one reason why they are inferior to the Pandigital Nova, which comes with 4GB as well. The Nova just showed up at QVC too. Anyway, the big question is what version of Android does it run? The other Pandigital Planets run Android 2.2, and the Nova runs 2.3. The latter is a worthwhile upgrade, so hopefully that’s what the Planet II runs. If so, that would make it the top dog of the bunch, that is if it has the same build quality as the other Planet models. You see, the Nova has double the memory and the newer OS so it is the clear better option to go with, but the Planet is better built, at least when comparing my Nova and Planet side-by-side. The Nova’s plastic body makes lots of creaking noises, the buttons are somewhat spongy, and the micro-HDMI port is very touchy. The Planet on the other hand doesn’t make noises, the buttons feel more solid and sit slightly above the frame instead of being inset, the mini-HDMI port works fine, and for some reason the touchscreen is slightly more responsive. So if it turns out that this Planet II has the upgrades the Nova offers as well as the same design as the other Planet models, it could very well turn out to be the best option. The pictures at QVC corroborate the same design, so it all comes down to the operating system. They’ll probably update the description page with more information by the time September 23rd rolls around. Guess we’ll have to wait until then to find out more. Pandigital doesnt not make a unit with kindle that is a third party unit that has been modified and sold on amazom just to clear the air. 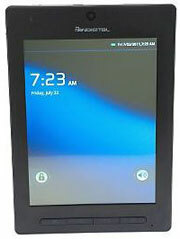 I’m a field tester for Pandigital and run the facebook page i love the pandigital novel e reader. They have not given me this unit to test or give my option on. I follow absolutely nothing of what you said. SORRY I STAND CORRECTED Pandigital does make a unit with Kindle this is the Canadian version since they don’t have Barns and Noble there. It’s not just a Canadian version; it’s available in the US too from Amazon.